Our season is mid-April to mid-November and requires prior reservations. 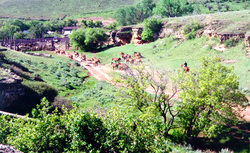 We are a family operated cow-calf operation and will share with others a real ranch experience. Bunk and log houses both have central bath systems and ranch cooked meals are served in a friendly comfortable dining room. Rustic and ranchy. Directions: Located about 50 miles South of Billings deep in the eastern slope of the Pryor Mountains. The last 8 miles are usually accessible only with 4-wheel drive vehicles, which are provided.